For experienced divers only, this thrilling drift dive begins at a wall depth of approximately at 18m/60ft, plunging to over than 60m/200ft-3,000ft. 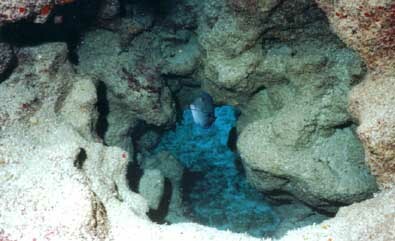 Occassionally this dive can be combined with Basket Reef as a drift dive, with an average current of 1.5-2 knots. Divers can usually expect clear visibility for viewing plenty of fish such as barracuda, parrot fish, large angelfish, sting rays, Bermuda chub, deep water gorgonians and even occasional dive buddy, the hammerhead sharks. The reef wall is carpeted with black coral, anemones and bright red sponges.